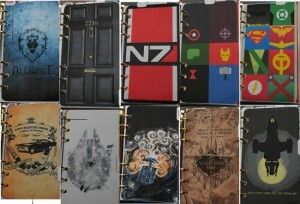 If you Google “Travelers Notebook”, you’ll get tens of thousands of hits. Shops, reviews, blog posts, videos and all types of tutorials. It was a bit overwhelming when I started. I wanted direction, but there was just SO MUCH information out there. So I dialled back the crazy and just thought about what I had been using in my ring binder. Month, Week, Notes, Projects. Easy, that’s three notebooks. So off I went in search of Australian sellers, and there are loads of great options out there, just not any that fulfilled my individual needs. So I decided to make my own. 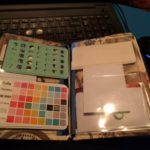 It’s really not that hard, and for someone who used to do papercrafts, it allowed me to use some of my existing knowledge and tools. I made two grid books, and a quarterly insert that has month view in the front, followed by week to 2 pages with a small grid notes section. Apart from notebooks, the other things that are handy to have in a “TN” are things like a dashboard and folders and pockets of all shapes and sizes. Dashboards are good to help protect notebooks from damage when put in bags and what not. They’re also good to store sticky notes. 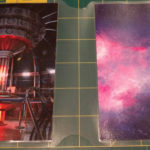 Mine is more decorative than functional, and is simply some printed pictures that have been laminated. What I do use a lot are folders and pockets. 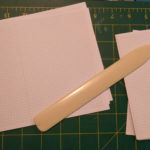 The “Kraft” folder, I made from a sheet of scrapbook paper. It’s not as sturdy as actual Kraft board, or a thicker cardboard, but it does the job. I’ve reinforced the spine with some clear packing tape, and put a clear card holder on the inside. The tri-fold plastic pockets was interesting to make. It’s made from a full A4 plastic letter file, which was about $2 from the Newsagents. 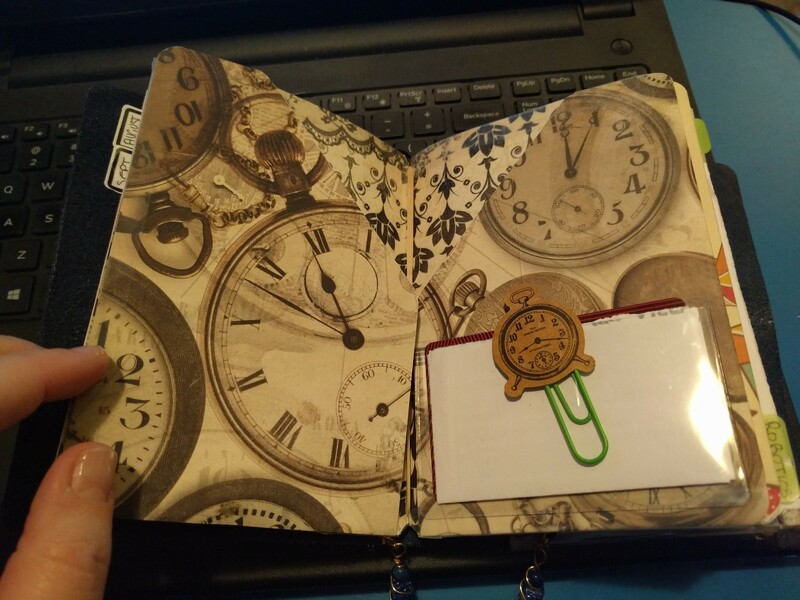 Some clever folding, cutting, and washi tape, and I have two full length pockets, and two shorter pockets. 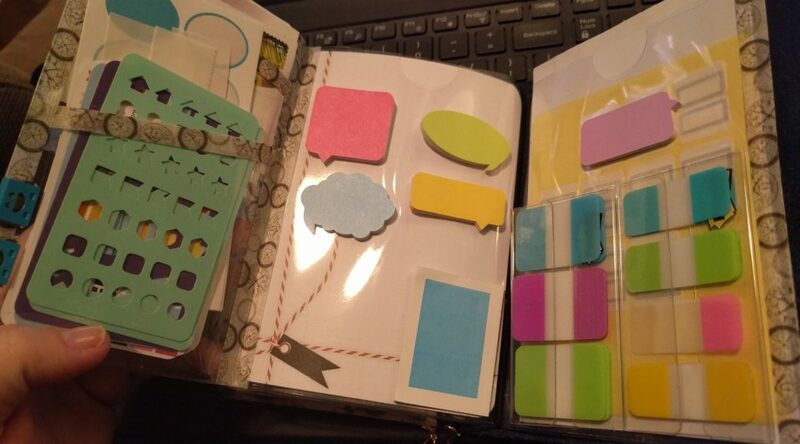 This is where I keep my larger items like stamps, stickers, tabs and flags, along with some sticky notes. This is the second one I’ve made, the first being for my regular size TN. Lastly, for the time being, is my card holder. 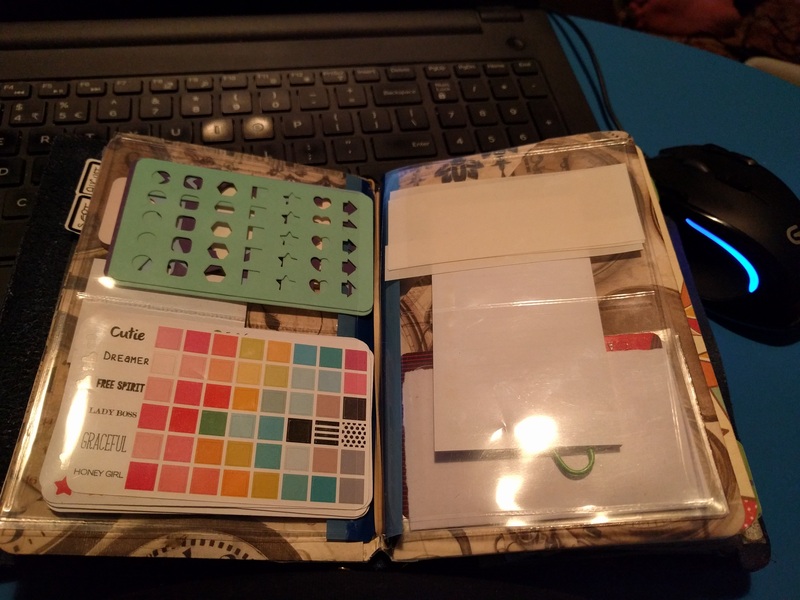 I like having card slots in my TN, it gives me somewhere to put my stencils (from Paws Plan Create), small sticker sheets, glue strips and other little bits and pieces that require a little more security than a pocket. I simply cut up an Ultra Pro TCG card sheet and taped two sections together. There are other inserts I’m considering for it too. I’ll just wait and see what needs arise. That’s the great thing about planners like this, you can change the setup as your needs change. Or chop and change the planner as it needs it. I’m excited for this new size, and my new set up. I remember back to my days in High School, and how I always looked forward to the start of the year. Not because I was starting another school year, but because I would get my new planner/diary for the coming year! 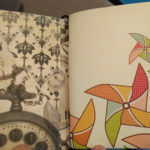 I loved keeping a diary, jotting notes, planning things, and generally knowing what was what. With the advent of the digital age, pretty much everything has been put online. I have found, though, that with everything out there in “the cloud” I have lost control of the feeling of being organised. For a while now I’ve been looking for a solution, to bring everything back into the real world, and to try to get on top of things. 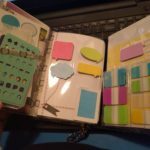 I’ve tried notebooks and diaries, but I like customisation, so I came to the conclusion that a planner/binder solution would be the best fit. I have been umming and ahhing about what to do, without jumping in too heavily, financially. Some of the filofaxes/dayplanners/binders can run pretty pricey! H ello half year sales! 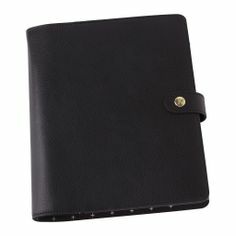 I happened on the almost perfect planner at Kikki.K, it was leather, A5, well made, and on sale for under $100! The only issue with it is that it was … well … pink. I am many things, but a pink girl is not one of those things. I kindly asked the sales assistant if it came in any other colours, say red, black, or navy. I was super lucky, and not only did she find a black one, but she was able to transfer it to a store that was easy for me to collect from. SUPER service from Kikki.K! It only took a few days, and I was very happy. The first thing I did was research systems, printables, and other things that “filophiles” are using. 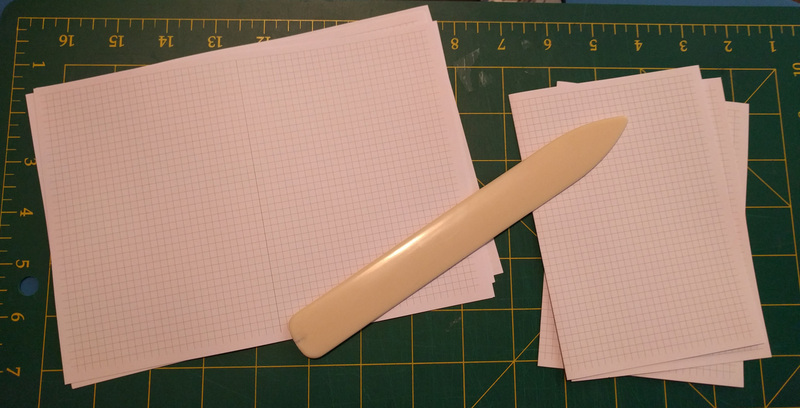 It’s been fun watching YouTube tutorials on setups, seeing mountains of printables, both free and in Etsy shops. 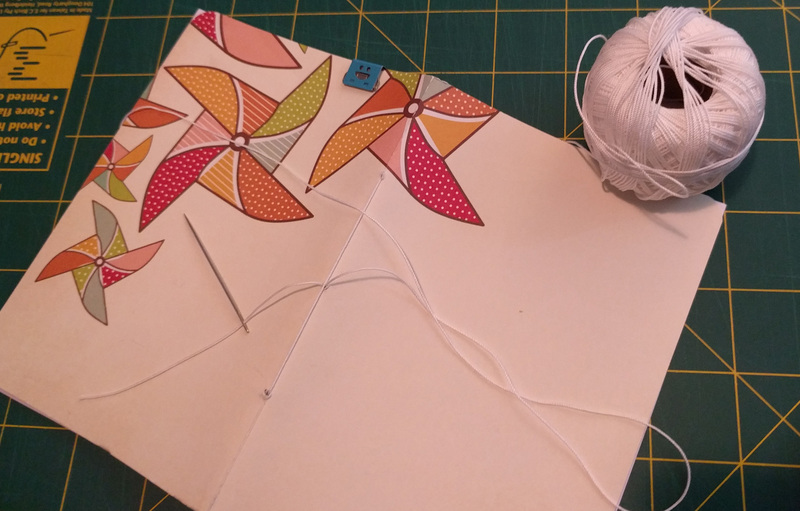 I haven’t bought any at this stage, preferring to tinker with the freebies, and making my own. It’s totally feeding my love of stationery supplies! 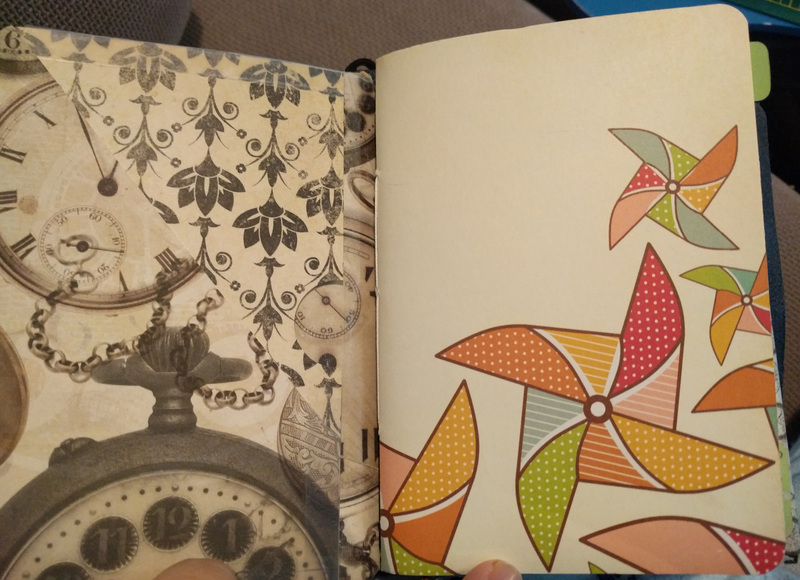 Pretty paper, pens, stickers, and all the other ephemera that goes with it. It turned out that for me, the A5 was just the wrong size. I had it set up just the way I wanted it, everything fit, and it was a good size to see everything at a glance, but it was too big and heavy to carry with me everywhere. I needed to go smaller. 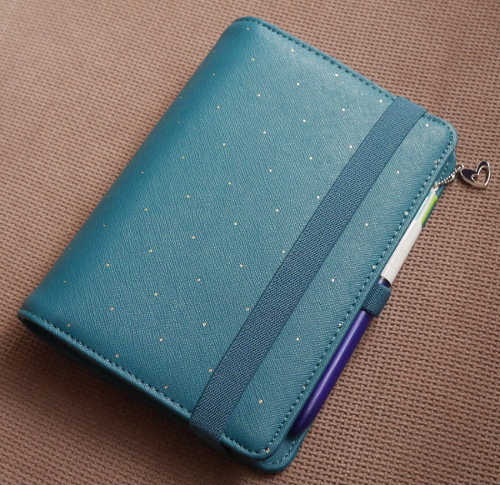 I got lucky again at Kikki.K, and found a “personal” size on sale in a lovely teal colour. This one definitely lends itself to being my permanent “sidekick”. I’ve set the personal size up with a week to a view section, and monthly fold out. 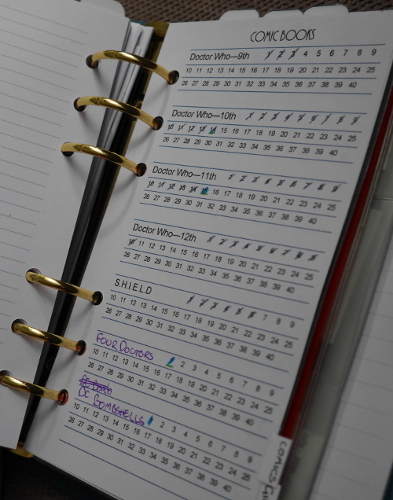 The other sections in there so far are wish lists, my comic book tracker, and a bill tracker. 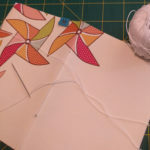 I have made my own dividers, and I still have plenty of room to add new sections as the need arises. I’m still tinkering with the setup, and I am only printing off inserts as I need them. This way I can make changes easily. I have really loved customising and adding my own brand of geek to it. 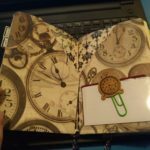 I’m finding that I am also really enjoying using it, taking notes, keeping track of my son’s school activities, noting when family members are travelling, organising things that I need to do, and just having it all in one place. Sure, I could have that with my phone, but the planner is more palpable, and it feels like it’s what’s been missing in my life. 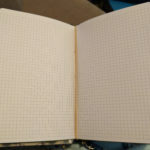 Since I started this adventure, I have found there is a whole culture around planners/filofaxes! Apparently it’s not uncommon for people to have multiple planners to match outfits, or different ones for different purposes! 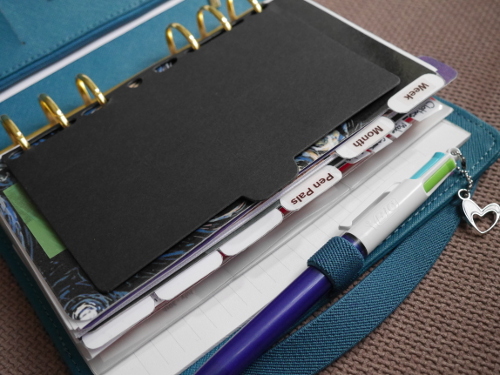 People are crazy for decorating, drawing, customising, and cutesying up their planners! 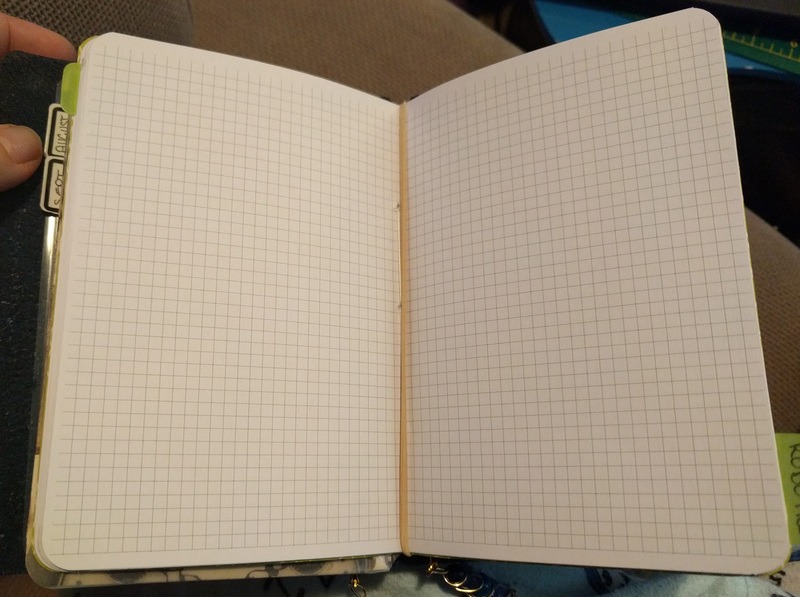 I found this to be amazing, but also really educational as to how far I can push my planner. I have kitted myself out with a few nice pens, some washi tape, and a few other small things that have helped get me started. 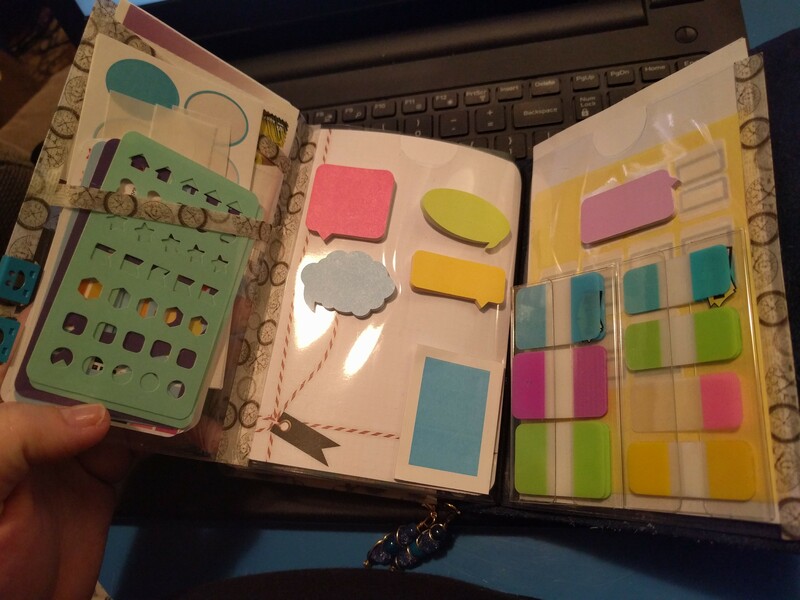 I’m also hoping I may be able to find another use for the A5 planner, I would hate to see it go to waste. If I can’t purpose it somehow, I will have to sell it. 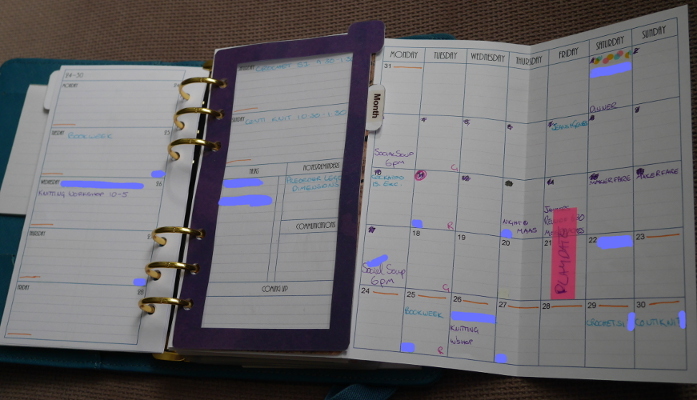 As much as I love my tech, and all my gadgets, reverting to a paper planner has given me a sense of calm. I feel more organised. Where do you plan? How do you plan? Are you a digifan or are you a filophile? Well, the pattern is traced and ready to go, the fabrics are washed, and the accoutrements are all bought. Still no movement on the actual assemblage of the bag, but I have been cross stitching my little heart out. 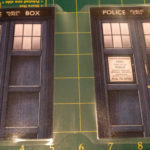 I started the Police Box sign on some black fabric, with what I thought was “waste canvas”. Turned out it was twisted canvas, and I could not remove it from my work without shredding the stitching. So I had to start over with black aida fabric, which required a little recalculation and recharting of the pattern. It has, however, come up a dream! I have also found some proper waste canvas, which I will use for the windows on the blue fabric. I had thought about stitching a Seal of Rassilon on the back of the bag, but then I considered just how much the bag will rub against my clothes, I have thought better of it. Instead, I have stitched a Tenth Doctor’s Sonic Screwdriver for one of the side panels of the bag (using the waste canvas on the blue fabric). 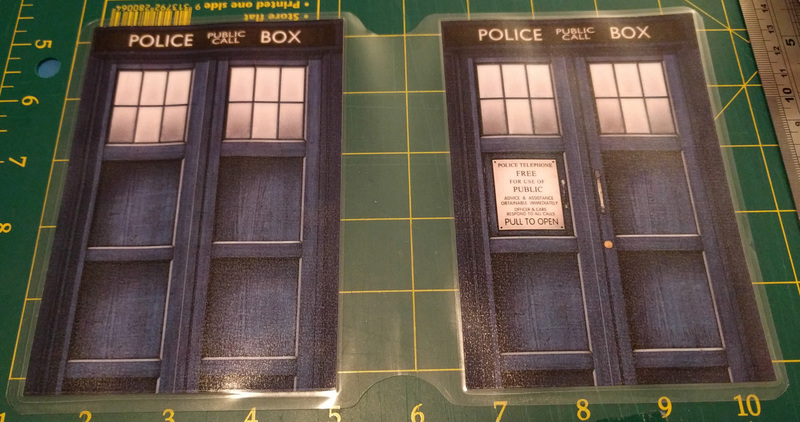 I have recently obtained the printable fabric, so now I’m on the hunt for a good, clean image of the “Pull to Open” sign on the front of the TARDIS. A lot of the ones I can find are either the wrong typeface, have shading, or just aren’t clear. So the search continues! I really should get on making my “plain” test bag, so that I’ll be ready to go with this when all the embellishments are finished.